Can you believe it’s already November? CRAZY!! During this month, Two Frugal Gals will be featuring some of our favorite Thanksgiving recipes and crafty, creative do-it-yourself Thanksgiving decorations to help make this time of year fun for your family. 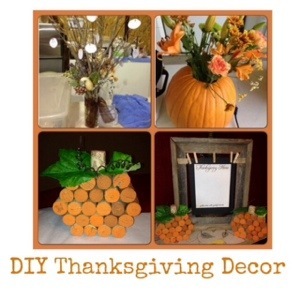 Who knew creating your own Thanksgiving décor could be so simple and fun? The greatest thing about these fall decorating ideas… they are simple and easy enough for your whole family to join in. 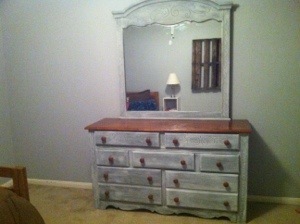 Totally upcycled and frugal!!! And decorations you can go back to year after year. So sit back and give thanks my friends to a wonderful time of year! Thanksgiving Tree Centerpiece. This is a fun custom holiday décor. This tree was put together gathering fallen branches with the kiddos near our house. We placed them in a beautiful clear vase wrapped and tied a beautiful ribbon and added a few fall flowers found at our local craft store. We cut out paper circles and punched holes in each of them for the family to write their thanksgiving blessings to hang from the branches. It’s a beautiful handcrafted look, making a perfect addition for your own seasonal decoration piece. 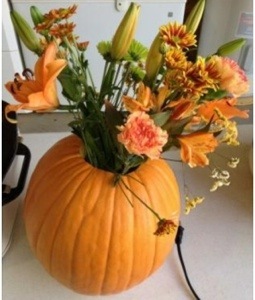 Why buy a new vase for your fall bouquet when nature provides the perfect one this time of year? We filled a pumpkin with a full bouquet of fall flowers in our medium pumpkin for a beautiful centerpiece. The pumpkin should last two or three weeks, and the fresh flowers and other items up to two weeks. For maximum use, pull out any wilting flowers and add fresh ones. Since it likely is a large bouquet and the container is small, remember to add water often. 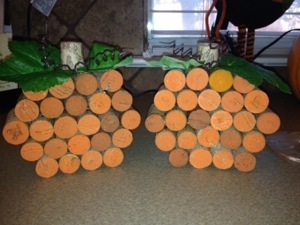 Wine cork Pumpkins. I love they way they turned out! My sister in law found this on idea on pinterest. What a great way up-cycle my wine corks. 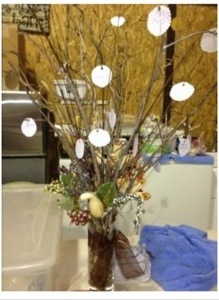 Just paint the ends of your wine corks, hot glue them together and add pretty leaves and viola! 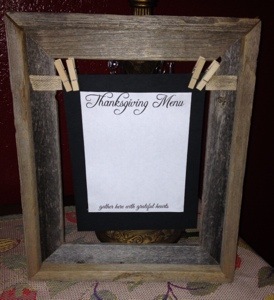 Make this framed Thanksgiving Menu using an old frame. All you need to do is remove any glass in your frame, hot glue your ribbon/twine to the back or front of the frame at the appropriate height to center your menu. Use mini clothespins to hang your menu from the ribbon. You can find a free printed menu by going to bystephanielynn.com and selecting your size. That’s all! Hang it! Lean it against a wall. I have recently started remodeling and trying to decorate. Frugal fashion has been my motto. I want things to look really good and put the smallest dent possible in my pocketbook. 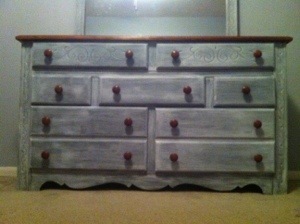 This time around I decided to refinish a dresser that my brother-in-law gave me. 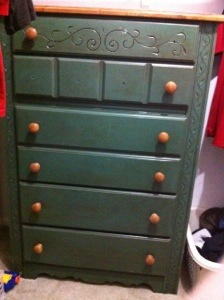 This dresser is over 20 years old and had some wear. The good thing is that it is solid wood. It is hard to find furniture that is made like that today. So I did a Google search and watched some YouTube videos and learned how to white wash. It was incredibly easy and turned out great! As you can see, there are some water spots on the top. You have to make sure you sand them completely down. Use a wood grade stand paper. 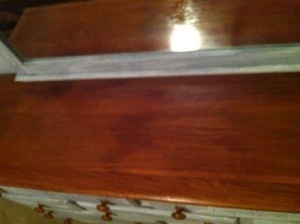 I am not going to whitewash this part so it needs an even sanding. 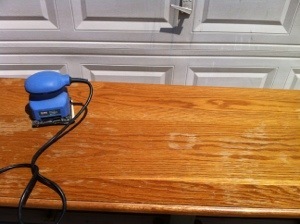 Once the sanding is done, use a damp cloth to clean off any dust. 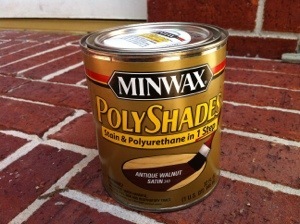 I used this Minwax Polyshades to refinish the tops. I have used this before on my bathroom cabinets and it works great! 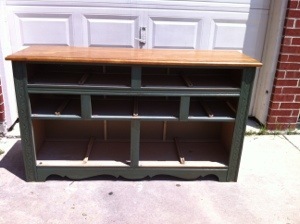 It has the stain and polyurethane in one easy step. Brush it on evenly and let dry completely. 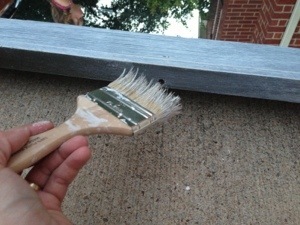 Put on a second coat if necessary. Doesn’t this look amazing? 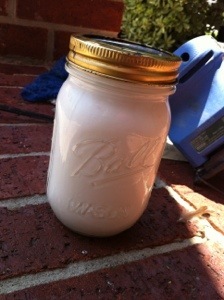 Now for the fun part…..whitewashing! You need 2 parts paint to 1 part water. For this I used 2 cups of paint and 1 cup of water. I dumped it straight in the jar and shook it until it was well mixed. 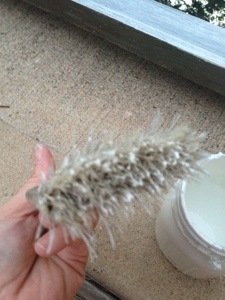 Before you start, do a very light sand on the surface you will paint. You don’t need to sand it deep, use a fine grain paper and just brush it across the entire surface. You are simply helping the surface accept the paint. Put a very small amount of paint on the brush. You can always add more, but it is hard to get it off if you use too much! 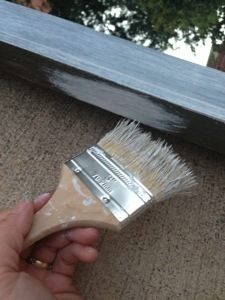 Brush the paint on to the surface and swipe it until it is a light coat across the surface. That little amount of paint did this entire bottom part of the mirror. Just keep brushing until you get the look you want. Continue until the entire piece of furniture is complete. Comfy Nap Mats is now Open!